WHAT IS AMAZON’S FRUSTRATION FREE PACKAGING PROGRAM? Amazon Frustration Free Packaging (FFP) is a tier of package design, created to remove excess packaging, to be environmentally friendly and to simplify the customer opening experience. With the growth of E-Commerce, packaging needs have changed and the customer experience has moved from stores to screens. In Store packaging was the leading means of advertising, which is no longer the case with online sales. Changing the market of goods sold online, allows products to have more streamlined packaging, which is more user and environmentally friendly. 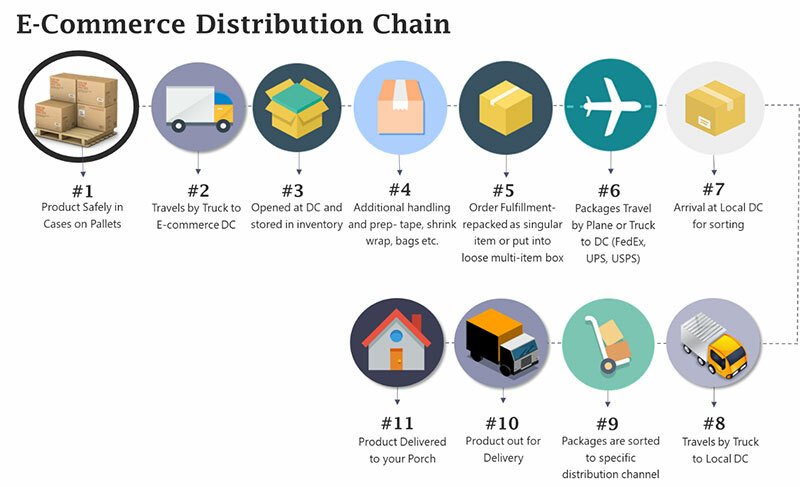 Along with the transition to E-Commerce; packaging must now be able to handle the many channels of shipping/transit, and have a simplified recyclable package that is easy-to-open. With these industry changes, comes the advancement of testing standards and regulations. Packages sold on Amazon.com must first be tested through the tiers on Amazon’s standards in order to be certified into Vendor Central. Amazon’s APASS program was designed by Amazon to help support vendors, sellers and manufacturers to obtain certification of their products as Frustration Free Packaging (FFP), Ships-in-Own-Container (SIOC) or Prep-Free Packaging (PFP). The members of the APASS Network have received guidance from Amazon and have already worked with manufacturers to supply, design and test Amazon Certified Packaging. The APASS Network allows vendors to quickly get their products tested to the correct standards without going through numerous testing supply chains. Purple Diamond is an official participant in the Amazon Packaging Support and Supplier Network (APASS). Our Laboratory provides APASS services directly to vendors, sellers or manufacturers related to package testing in compliance with Amazon’s certification test methods & packaging design to comply with Amazon’s packaging guidelines. As a part of the Amazon APASS Network (Amazon Packaging Support & Supplier Network), Purple Diamond is certified as an inclusive testing facility key for Amazon vendors. Along with current ISTA, ASTM, and UN/DOT certifications, the Engineers at Purple Diamond will design, test and validate your products/packaging as Frustration Free Packaging, to Ship in their Own Container, and as Prep-Free Packaging. Amazon utilizes the ISTA 6 test method to certify Amazon Standard Identification Numbers (ASINs) to ship in their original manufacturer supplied packaging. The 6-AMAZON.COM test was created by ISTA in alliance with Amazon.com, and is used as the general protocol. FFP testing for Amazon falls under the ISTA6- SIOC procedure. Three different categories are used for each type of packaged product tests the; shipping method, handling method, and weight & dimensions. Verification includes free-fall drop testing and vibration testing which stimulates the distribution and carrier supply chain items will endure. By testing for the E-commerce channel that items go through, we can validate that your products will maintain their integrity and arrive to customers undamaged. 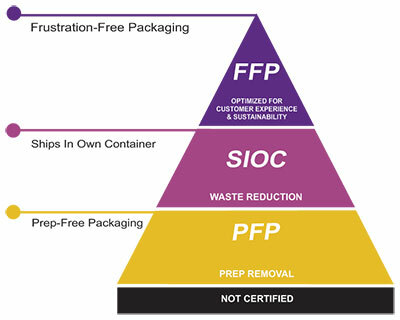 Tier 1- Frustration Free Packaging (FFP) is capable of shipping in its own container in minimized, fully recyclable and easy-to-open packaging. This ensures the most optimal experience for our customers. Tier 2- Ships In Own Container (SIOC) minimizes waste through ensuring that packaging is designed to ship without the need for an Amazon over-box. Tier 3- Prep-Free Packaging (PFP) is designed to ship effectively without the need for Amazon to apply additional prep to prevent damage of leakage. Purple Diamond can assist in packaging design that meets the standards required for Amazon Packaging Certification. We help vendors optimize their products for Amazon’s APASS Network FFP program while also reducing packaging cost and improving their efficiencies in their supply chains. Packaging can be designed to be protective against damage which is required for FFP, SIOC, and PFP certifications. The requirements and considerations of over-sized products can be evaluated and optimized to move efficiently through Amazon distribution networks. Contact Purple Diamond to get a consultation on your products for Amazon APASS Vendor Central. Copyright © 2019 Purple Diamond Package Testing | Website by D.C. Helms, Inc.